In November 2015 our founding director was selected as Curator of the Month by the Art Fund, while she was working at the Victoria and Albert Museum as Art Fund Curatorial Fellow of Photographs. During her time at the V&A Federica worked on the display Facing History: Contemporary Portraiture and curated the exhibition Peter Henry Emerson: Presented by the Author at Nottingham Castle Museum and Art Gallery (Nov. 2015 – Jan. 2016) Below the Art Fund asks what inspired Federica to become a curator in the first place and what the biggest challenge of her career has been so far. 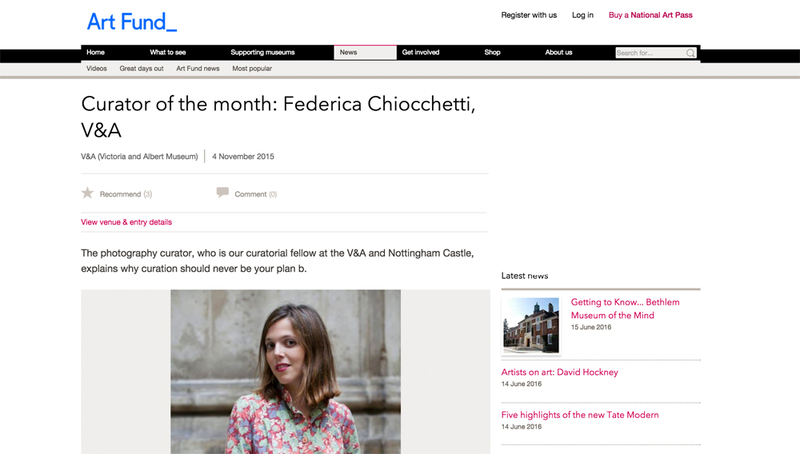 Federica Chiocchetti: Federica Chiocchetti, 2015 Art Fund Curatorial Fellow at V&A and Nottingham Castle Museum, and Founding Director of Photocaptionist. AF: What inspired you to become a curator? FC: Since I was a child in Tuscany I have always loved museums and art galleries; I just felt at home at them. I remember being interested not only in the works displayed but also in how they were presented. I never had the urge to be an artist – I preferred the idea of working with them. Later on some really amazing and controversial contemporary art exhibitions – by provocative curators like Harald Szeemann or Massimiliano Gioni – deeply re-shaped my perception of art history. At the moment, the pleasure of working with original objects from a museum’s collection and the joy of collaborating with emerging artists is what keeps me inspired every day. AF: What was your first job in the art/museum world – and how did you get to where you are now? FC: My university years were nomadic: I studied economics, literature and book publishing, and I lived between Milan, Santiago de Chile and New York the majority of the time. Art history is something that has always been part of my life, as a self-taught immersive experience: devouring books, going to as many exhibitions as I possibly could and talking to knowledgeable people. After a couple of years working for the Milan publishing house Bruno Mondadori and after my MA in Comparative Literature at UCL, where I researched the relationships between photography and literature, I worked as assistant curator of the international photography festival FORMAT in Derby. It was a fantastic learning opportunity that allowed me to meet interesting practitioners and curators. After FORMAT I set up my own platform dedicated to the relationship between images and words, the Photocaptionist, through which I started to write about photography for a number of international magazines, as well as curating exhibitions independently, including the Kunsthalle in Budapest and the forthcoming Photo50, within the London Art Fair 2016. I also spent a year at the wonderful Archive of Modern Conflict with Roger Hargreaves, mainly working on an Italian press photography project which then became an exhibition and a book, Amore e Piombo [Love and Lead], that we produced for the Brighton Photo Biennial. Last year, the Art Fund/V&A/Nottingham Castle curatorial fellowship in photographs came up and I applied. AF: What has been the highlight of your career – and the biggest challenge? FC: I felt very happy when Amore e Piombo won the 2015 Kraszna-Krausz Best Photography Book Award in May this year. I am grateful for the opportunity to work with a fantastic team and magnificent collections at the V&A. And I won’t forget the great feeling of finding an assumed lost print and a letter by P.H. Emerson in the archives of Nottingham Castle. In terms of challenges, any exhibition, regardless of its size, I think is a big challenge, especially if you think about the many things that can go wrong, production wise. AF: If you had one piece of advice for aspiring curators, what would it be?